Crazy April EU league started. 12 players,so 3 tables with 4 players,2 new players in online competions. All games finished before time limit and we see GW in each games. We also expect next days to players self organize games. I know it would be additional effort, but reading the results together with the decks played would be just AWESOME. After last weeks dominance by the finnish playgroup, the French Powerhouses strike back and take both Gamewins. Grats! 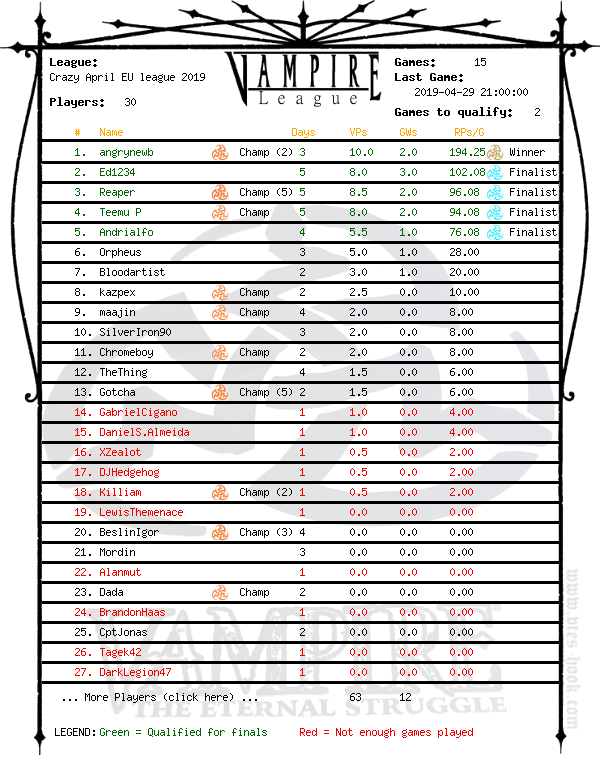 Congrats to Marius for being sandwiched between two combat decks and still managing to pull a GW! The big "E" found himself in need to backrush constantly, while an opportunistic Jost Werner swept the table in 1h30min. Even though there was a multirush Enkidu, Pentex Subversion didnt see any play. Last edit: 10 Apr 2019 20:28 by angrynewb.